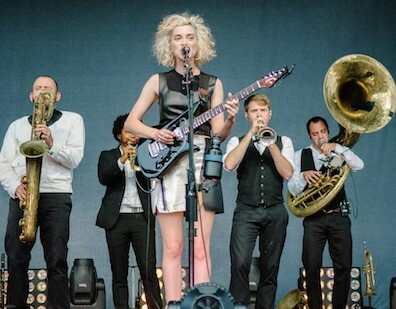 A New Orleans street-style brass band backed the twosome (he a pop music icon, she an indie-rock darling) to re-create the album the unlikely duo put out in 2012. It was a fresh and invigorating sound that was unique to the music that either had put out previously on their own, and it completely shocked the audience members' systems into happiness. 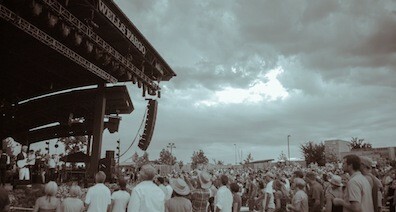 There were choreographed theatrics with the band taking formations and moving in time and rhythm with each song. The brass band is what brought the show to life to make it just that: a show. As campy as it could have been, the ensemble pulled it off with sincere charm, illustrating the songs' vivid imagery through dance. Byrne was in a sharp white suit with black suspenders. His hair was shockingly white and perfectly frizzy. His voice was still pure and flawless after all these years. He is certainly either a deity or a wizard—it’s hard to decide; he’s probably both. At one point, he even started to tap dance, so apparently he’s also part Gene Kelly. 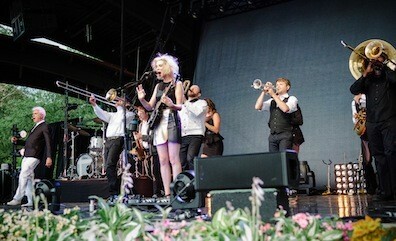 Annie Clark was lithe and magnetic in her gold heels, '80s-style skirt and newly dyed white-blond hair. She would weave and bop in a wonderfully pretentious robotic rhythm alongside Byrne and the rest of the band. Just like their songs, each and every move was thoughtful and artistic with no lack of their respective signature quirkiness. It was like watching a marching band on drugs in a pasture of roses. It was strange and compelling. It was beautiful and bizarre. It was like eating ice cream while drinking wine. It was strange and joyous. Their live version of "This Must Be the Place (Naive Melody)" was heartbreaking, gorgeous and still earnest after all these years. And when Byrne did "Wild Wild Life," each member of the brass backing band had a turn to sing lead on the song regardless of their vocal ability, which gave the hit a delightful homage to Byrne’s 1986 movie True Stories. 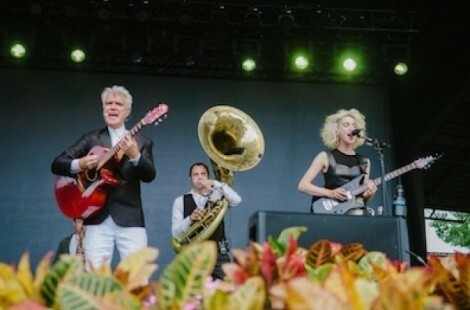 Byrne and Clark played songs from their collaboration, sprinkled with some of St.Vincent’s songs (“Cheerleader,” “Marrow,” “Northern Lights,” “Cruel”) as well as a few iconic songs from The Talking Heads (“Wild Wild Life,” “Burning Down the House,” “Road to Nowhere”) and a few from Byrne’s solo career (“Strange Overtones,” “Like Humans Do”). The twosome accompanied each other gracefully, danced merrily and entertained the crowd with authentic and astoundingly great music. 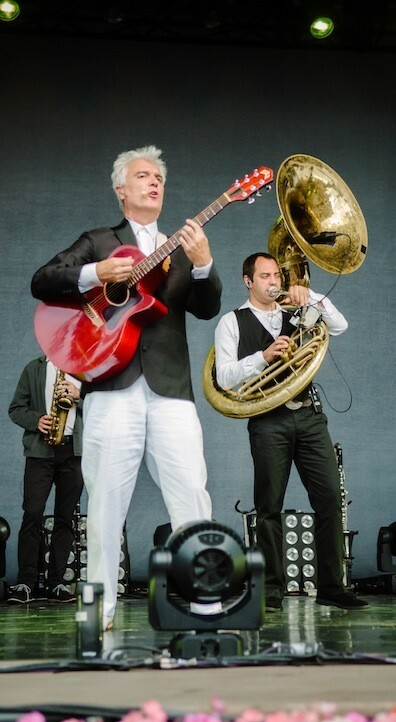 On the seventh day, God created David Byrne, and he saw that this was good, so he made Annie Clark as a companion for him, and God was pleased.